Visit the beautiful Columbia River Gorge! 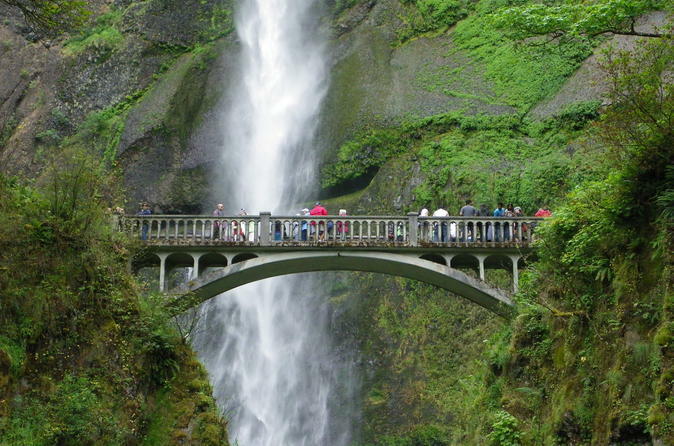 Your adventure will take place along the Historic Columbia River National Scenic Byway, where some of the locations we may stop include: Portland Women’s Forum, Crown Point Vista House, Latourell Falls, Multnomah Falls, and Shepperd’s Dell. You tour will start with the view from Portland Women's Forum. This location is absolutely breathtaking and it's one of the best spots to soak in a view of one of the most beautiful places on earth: the magnificent, awesome Columbia River Gorge. Next, we will stop at Crown Visit Point House with a complete overlook of the Gorge region. Crown Point Vista House, best known of the scenic lookouts along the Historic Columbia River Highway, provides a panoramic view of the Columbia River. The Crown Point Vista House was built in 1916 and refurbished and completely remodeled in 2005. Our next stop is Latourell Falls. This waterfall plunges 249' over a massive wall of columnar basalt, some of the best formations in the Pacific Northwest, before cascading hastily toward the Columbia River. This waterfall is usually most recognized for the large patch of bright yellow lichen adorning the cliff face to the right of the falls, and this characteristic has led many famous photographers to this captivating location. Sheppherd's Dell- In 1915, a local dairy farmer named George Shepperd gave all that he had (this tract of land) to the City of Portland as a memorial to his wife. The upper fall is around 42' tall. The lower tier is around 50' tall.